See how compelling business presentations can be with the RICOH PJ X3340N Desk Edge projection system. 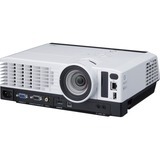 Take advantage of revolutionary lens technology, advanced connectivity options and quiet, efficient operation for impressive, high-definition projection in conference and training rooms. The innovative Desk Edge Series is designed with forward-facing exhaust and easy-to-reach controls, so it can sit on a table's edge without distracting the audience. Use it as a standalone projection system or as part of an integrated Ricoh Managed Document Services (MDS) strategy and streamline efficiencies for your entire fleet of business communication devices.